APLS Transport is an innovative, portable, pole-free stretcher designed to safely and quickly move injured personnel out of harm's way. 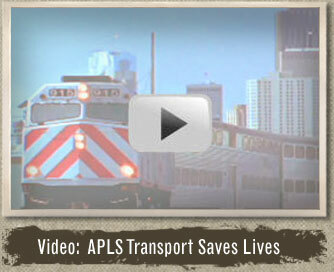 APLS Transport is ideal for emergency transport situations, especially when traditional EMS solutions are not readily available. Constructed with a durable canvas and highly absorbent core, APLS Transport can absorb up to 4.5 liters of fluid while supporting up to 450 pounds, wet or dry. The treated nylon backing also protects against wind and moisture, helping to keep patients warm. Each APLS Transport is available individually packed in a waterproof bag to protect the cellulose core from water damage and possible contamination.